Continuing on from my review of Urban Decay All Nighter Make up Setting Spray, there are 2 other products I credit with helping my make up last longer. In addition to improving its wear time, they also greatly improve my make up application. 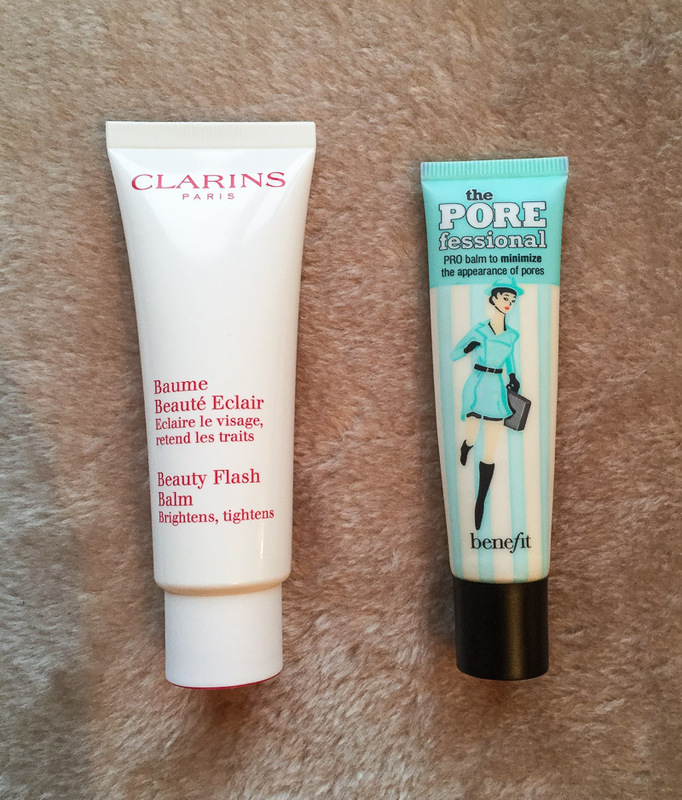 Clarins Beauty Flash Balm and Benefit The POREfessional Face Primer are two make up primers of cult status, and for good reason. It may be unconventional, but I use both of these on different parts of my face. I have used them for a while now, and couldn’t do my make up without either. Benefit’s POREfessional is advertised as being the best selling primer in the UK. It’s supposed to minimise the appearance of pores and fine lines and help your make up last. This can be used all over the face; however I only use it on my T-zone, applying it to my nose and my forehead. The reason for this is that it helps with the pores on my nose, creating a smoother, more neutralised base to apply foundation. And I use it on my forehead to smooth it out and help prevent foundation from settling into my fine lines as much. Benefit say you can use this either under or over make up, however I have yet to try the latter. To apply under make up, you pat on a thin layer starting in the centre of your face and moving outwards. I tend to pat a little extra on to particular areas I feel need a bit more, such as my deepest lines or if my pores are more emphasised than usual on my nose. To apply on top, gently pat on a dab of it and blend over make up. It’s a very silky and lightweight balm, as described, with a nice consistency which is easy to apply. The best word I can think of to describe this is probably velvety. It’s a velvety texture that gives a smooth surface to apply your make up on top of. It’s an oil free formula and suitable for all skin tones. It doesn’t shrink pores the way some other primers are designed to do, but rather fills them in and evens out the skin. I also find it balances out some of the redness I get. I have used this for years and it remains a staple in my routine. For the rest of my face, I use Clarins Beauty Flash Balm. As I’ve previously mentioned, I have very dry skin, and because of this foundation application is quite difficult. I can no longer use a foundation brush as I had done before becoming unwell. I instead have to use a sponge as it helps prevent foundation from clinging to dry patches and it gives a more even and nicer finish. 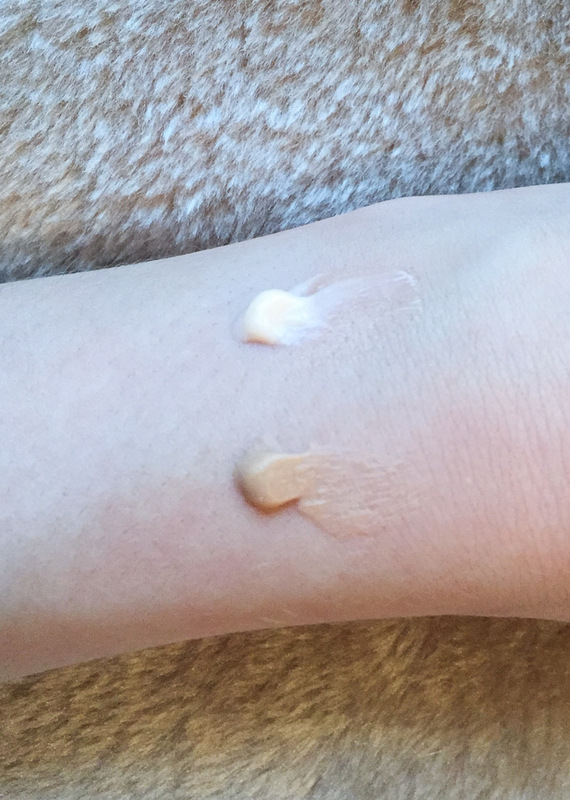 Still though, application wasn’t great and I would need to be cautious, gently patting and dabbing foundation onto my skin especially on my driest areas. To combat this, I had been researching the best primers to use, as Benefit’s POREfessional, whilst amazing on the T-zone, wasn’t working the way I wanted on the rest of my face. Make up primers are now big business so there are an abundance of options available. The one most people seem to love and regard as the best is Clarins Beauty Flash Balm. It has a loyal following and over the years has won an abundance of beauty awards. I had a generous sample of it that my mum had gotten in a free gift with purchase which she had given me, and I decided to give it a try. I was immediately impressed and actually quite shocked at how good it is. The difference it made was incredible. It helps massively with foundation application, really smoothing and hydrating my skin. It creates such a good base and a lovely dewy radiance I’d never been able to achieve before. And on top of this it also made my make up last much longer. After just a week of using the sample I was blown away and ordered a full sized one. I’ve been using it ever since. Clarins describe this as being the ultimate pick me up for tired and lifeless skin, providing moisture and erasing signs of fatigue by brightening and tightening. It’s a thick, creamy balm which contains Olive and Witch Hazel extracts to smooth the skins surface by tightening and firming to diffuse the look of lines and wrinkles, and it contains Bisabolol to soften and soothe which helps restore radiance. There’s sometimes confusion surrounding this product as it can be used in different ways. I personally use this as a primer before applying make up, but some use it as a moisturiser and it can also be used as a face mask. It’s advised not to use this everyday as it will lose its effectiveness. However, I have been using this now for about 7 months, I apply it every time I do my make up which on average is 4 times a week, sometimes 5, and it still works as brilliantly as it did at first. I’ve also read plenty of reviews from people who use it as their everyday moisturiser and swear by it for that. To use as a face mask, Clarins say to use once or twice a week, leaving on for 10-15 minutes. I haven’t tried it for anything other than a primer, so I can’t comment on its other uses. I use it as described before make up application; however it says to use in place of your moisturiser after cleansing and toning. I can certainly see why many wouldn’t need moisturiser as this does do an excellent job at hydrating skin. For me though, my skin is so dry that I do still need it. What I do is cleanse and tone, apply my eye cream and a light layer of moisturiser, then I do my eye make up whilst it sinks in, and then apply this balm. It’s about finding what works best for your skin. You only need a small amount, which makes this last a long time. You don’t want to use too much as it’s not going to work as well. I squeeze out about a pea sized amount and dab some on each cheek and a little less on my chin and upper lip. I then smooth it out into a thin layer without rubbing or massaging, and follow by immediately applying foundation. If you want to just use this as a moisturiser without make up, you still apply in the same way, and it’s suitable for morning or night. It is definitely best to do your foundation straight away for the best results rather than waiting for it to sink it. It has a light, pleasant fragrance and leaves skin feeling very soft and smooth. It feels almost a little tacky but that helps when you put your make up on top. It gives instant radiance and I do feel some tightening. Very much appreciated by my dull skin as it’s always fatigued since sleep is difficult for me and I suffer from terrible tiredness from having Fibromyalgia. This magical beauty booster is an absolute must have for me, giving me a more luminous complexion and extra wear from my make up. I love it and think it’s worth every penny. Primers are certainly not essential, and for a lot of people their moisturiser is sufficient enough in preparing skin for make up. For me though, I find them extremely beneficial. 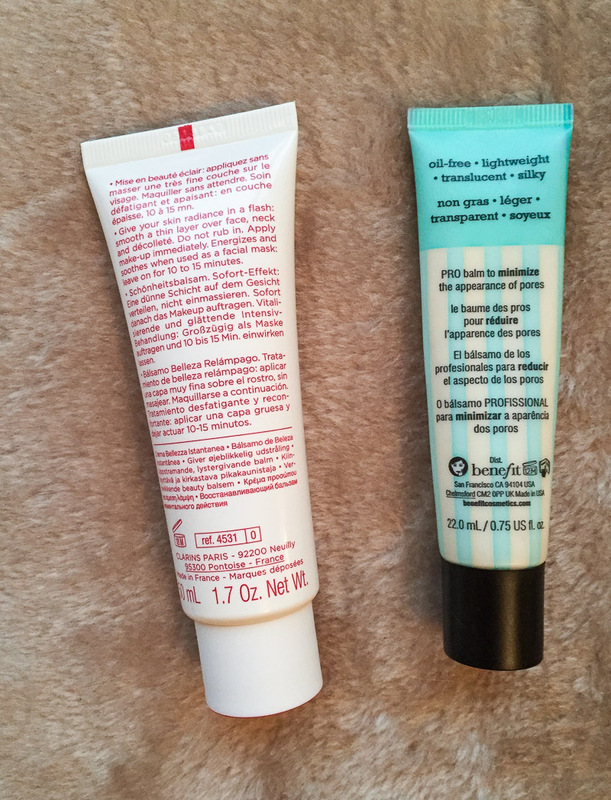 Both of these work perfectly on top of my moisturiser which is a must for me, and a lot of other primers I’ve tried don’t do. These are very different types of primers with different textures and results. Benefit’s is lightweight and has a very silky, velvet finish which smooths out and reduces the appearance of my pores and lines. Whereas Clarins’ is a dewy, thick balm which hydrates, tightens and softens the skin and creates luminance. I use both because my face has different needs. They both create a smoother surface for skin and ease foundation application. And both primers do an excellent job at improving the staying power of my make up. I highly recommend both depending on what you’re looking for, and in conjunction with Urban Decay’s All Nighter Spray my make up is lasting much longer than ever before.